In the last week I’ve had a few memorable beer experiences and I’d like to share them. I’ll mention my time at Brewer’s Republic here and then at Blue Star below. Brewer’s Republic has been killing it with Josh as the new General Manager. Pretty much every week (often more than once a week) they have special tap takeovers, they’ve started selling some ridiculously good bottles of beer (Drei Fonteinen Oude Gueuze and others!) and they’ve even had some really great out-of-state beers on tap. I plan to head there tomorrow or Thursday to get a glass of the North Coast Barrel Aged Rasputin on tap. 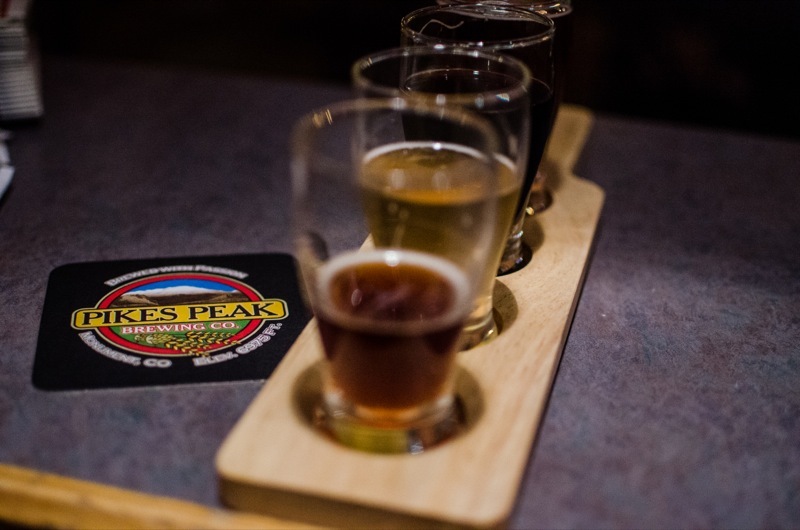 I visited for what was a really special tap takeover where our friends from Pikes Peak Brewing brought some pretty special beers to town. I got a flight of the first four beers, all were aged in barrels or had wild yeast. The Devil’s in the Woods was my favorite. Normally the Devil’s Head Red is a nice hoppy red ale but the hops had been subdued with some smooth oak notes, however the bitterness held on pretty nicely. 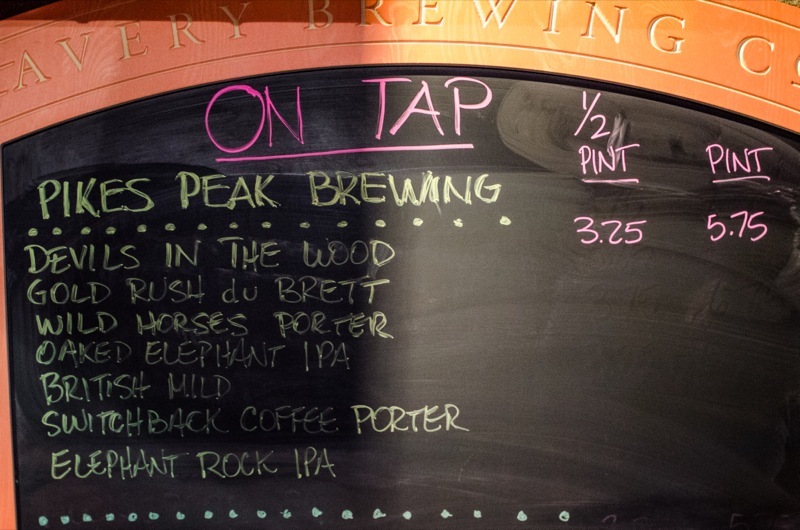 Another standout was the Wild Horses Porter. I think the brewery had hoped the beer would pick up oak and whiskey notes but the wild yeasts turned the beer sour. Nonetheless it was awesome, the astringent malts mixed with the slightly acidic new character was a good match. You may remember, Pikes Peak only recently opened up their barrel room and expanded their barrel capacity. So, this was a really fun night, and I was really pleased to see some of the new beers coming out of Monument. Pork Belly and Scallion Potato Cake paired with Avery’s Dépuceluese and Odio Equum. I also attended the Avery barrel aged beer dinner at The Blue Star. The event was sponsored by Coaltrain and they brought Andy Parker, the barrel specialist at Avery, down from Boulder to talk about the beers we drank. All the beers, with the exception of Rumpkin, are part of their one-off barrel aged beer program. Rumpkin is aged in rum barrels, but also comes back annually. The first pairing was one of my favorites. Perhaps I’m biased though, Avery’s Muscat d’Amour is my favorite Avery beer. It was paired with a row of brioche, each filled with a different offering of duck. Another standout was the Lamb Wellington with hazelnut duxelle toast. The mushrooms were an amazing addition to this course and the pairing with Avery’s super complex and sour Immitis was one that I can still remember perfectly. The dessert was also insane and I was very tempted to finish my neighbor’s plate when she said she was full. Instead I allowed her husband to finish the job. We had candied and smoked bacon with a bourbon caramel milkshake. I didn’t think this would pair to well with the rum-barrel-aged pumpkin Rumpkin beer, but boy oh boy was it fantastic. The shake cut through any alcohol heat and allowed the pumpkin and rum notes in that beer to pop out. This was another fantastic beer dinner by the Blue Star and Coaltrain, I’m really happy I could attend. I’m also glad they went the extra mile to bring Andy into town. He had a lot of really great anecdotes for each beer, explained technical information in a relatable way and was really fun to talk with. If you haven’t been to The Blue Star in a while I would recommend checking it out. On Thursdays they have half-off on their bottle selection, and it’s a nice bottle selection at that. The beer dinners are pretty fantastic as well.